Being new to the book publishing and marketing fields, it takes time to learn the “in and outs” of the craft. I’m happy to report that it is actually possible to teach an older dog, new tricks, even when that dog didn’t have a computer, or “smart” phone or just about anything electrical (difficult when you didn’t have electricity for several years) when he was a pup. Unlike the pups today. This video was something I created last year, in order to help people get a better feel for my memoir. I had known about film trailers, but I didn’t realize that book trailers were also becoming popular. I think it is a brilliant idea, as it can portray more in one minute than by writing a page or two describing the essence of the book. I was delighted at the way I could blend in photos of my family and the area in which we lived, then add a sound track which complimented the story line so beautifully. I am currently finishing the sequel/book 2, with a proposed publish date of late Spring, 2018. This means that most of my focus will be on the new book, since the first baby is standing, walking and ready to take off, leaving me to hold the sibling’s hand and do it all over again! I hope those of you who have not had a chance to view the book trailer before, will enjoy it and please feel free to request the free online chapters, to get an idea of what my memoir holds in store. 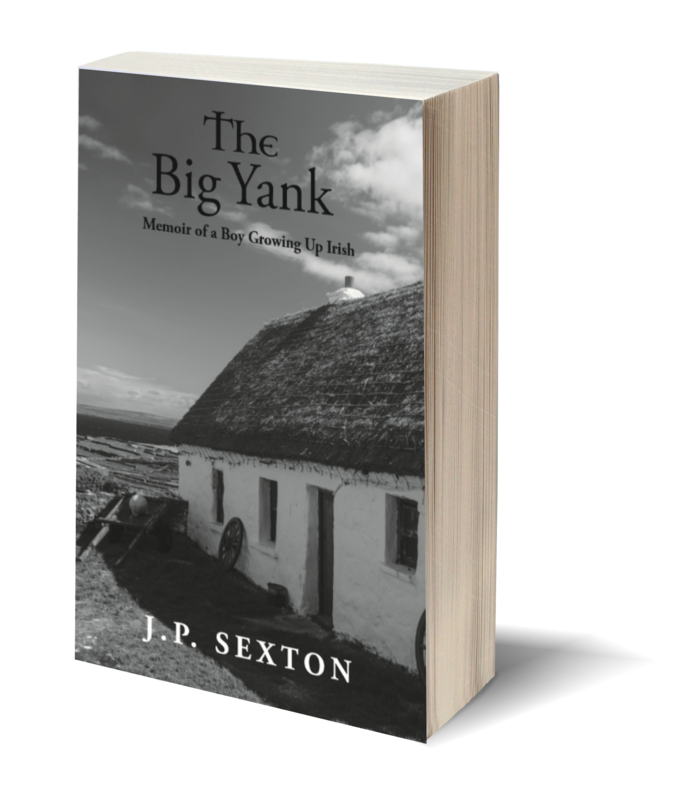 I loved reading The Big Yank. A different culture but still growing up in my time period. Looking forward to It’s sigling, as you have said. Thanks, Irene. The sequel is quite different, as it is set in various different countries around the world in which I worked and lived, other than Ireland. It’s just as crazy though, maybe even more so! I’m anxious to see what the readers think. I’m sure it will be equally as good a read as the original. Funny indeed, yet beneath there is hidden the reality of hardships that were endured in Ireland in relatively recent memory. Thanks, John. The original has been incredibly well received and I sincerely hope that readers will enjoy the sequel as much.